Debra Gabel started Zebra Patterns in 2000 to produce patterns and panels for colorful, graphic quilts. Zebra Patterns sells applique patterns featuring flowers, biblical scenes, and state and city postage stamps, among other motifs. 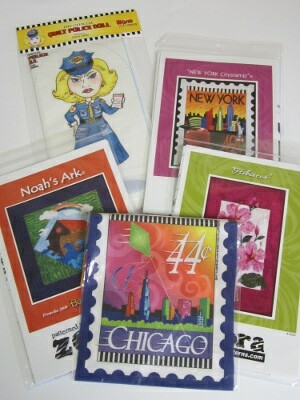 In the FaveQuilts giveaway sponsored by Zebra Patterns, winners will receive six patterns, including the Chicago Citystamp Mini Panel, two Quilt Police Doll kits, a Hibiscus wallhanging pattern, a Noah's Ark wallhanging pattern, and a New York Citystamp wallhanging pattern. All Zebra Patterns exhibit a lively use of color and bold, graphic shapes. This aesthetic makes Zebra Patterns easy to work with when making applique quilts. From bible stories to cityscapes, Zebra Patterns infuses every pattern with a wide range of colors and shades. Of course, the colorful samples on the front of each pattern may not represent the fabrics you choose to work with when making these patterns, but they serve as vivid inspiration for your own fabric choices. The Noah's Ark pattern in this giveaway collection comes from the "In the Beginning" line of Zebra Patterns, which features twelve patterns depicting bible stories from the Old Testament. Each pattern can be used to create an individual wall hanging, or the patterns can be used together as blocks in a full-size quilt. The Noah's Ark pattern specifically shows the ark floating in a choppy sea with a rainbow and a dove overhead. The pattern includes applique templates to create the block using fusible applique techniques, although it can easily be adapted for hand applique methods. The pattern finishes as a 14" square block or a 20" square wallhanging. Similarly, the Hibiscus pattern in the giveaway is a selection from the Zebra Patterns collection of floral patterns. Each pattern in this collection features a different flower in a 12" x 20" appliqued wall hanging. The flamboyant hibiscus flower is just one among the list of beautiful floral wall hangings you can make, including coreopsis, bleeding hearts, forget-me-nots, and speckled lilies. The patterns include both a sheet of applique templates and a positioning sheet that matches each applique template to its position by number. The New York Citystamp pattern comes from a wide collection of patterns that showcase Debra Gabel's personal passion for travel. Each pattern is conceived as a postage stamp customized for different cities and states. The designs are available as full-sized fabric panels, mini panels (as in the Chicago Citystamp included in the giveaway), and applique wall hanging patterns. Show pride in your city or state with one of these beautiful postage stamp quilt patterns, or make a quilt with stamps for every state you have visited! Other collections from Zebra Patterns include butterflies, birds, holiday houses, and an assortment of children's patterns. Zebra Patterns are available online or in your local quilt shop. You can even get a collection as a Block of the Month program! Win a Brushstrokes Fabric Bundle from Studio e! Chance to win the Pout Pout Fish Fabric Collection! Chance to win the Riley Blake Tarzanimals Fabric Collection! Enter for your chance to win the Dancing Diamonds Quilt Pattern Giveaway! Enter for your chance to win the Dancing Diamonds Gem Bag Pattern! Chance to win Ankara and Lace Zara Fabric! Win an Olfa Folding Cutting Mat!